Google announced an experimental application for its Android mobile operating system, which allows you to search your phone using written gestures. 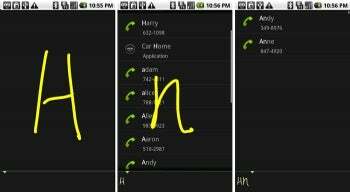 Instead of bringing up the keyboard, users of the newer Android phones can just draw letters on the screen to search through contacts, music or apps. When a spoken search query using search by voice is inappropriate, the new Gesture Search for Android phones should come in handy. Just open the application and draw a letter with your finger on the screen. Results for the respective query will then be brought up on the display. If the letter you drew on the screen is too similar to another letter of the alphabet, the app will bring up results for both potential queries. You can erase a query by swiping left to right, or right to left to remove the last letter of the query. The experimental app also learns from your search history, so it will bring to the top of the list search results you used previously. Gesture Search for Android can search through most files on your phone, including contacts, applications, Internet bookmarks, music tracks, or video files. However, the app is only available to U.S. customers running Android 2.0 or above, further segmenting the Android market. Only phones such as the Motorola Droid and Google Nexus One will support Gesture Search for now. Devices running Android 1.5 or 1.6, such as the T-Mobile G1, T-Mobile MyTouch 3G or the Sprint Hero cannot run Gesture Search. Also, availability is limited to U.S. customers only. If you are the happy user of an Android 2.0+ device in the U.S., you can download Gesture Search now from the Android Market. There is a general consensus on Google's official blog over the usefulness of Gesture Search for Android, especially if integrated in the contacts app. But many Android users are feeling left out of Google's strategy to keep most of new software releases away from pre 2.0 devices. Most of the Google Android user base is still using devices that haven't been updated to 2.0+. Actually, there are still new devices set to come out this year from Sony Ericsson running on Android 1.6. Android software updates are dependant on manufacturers and wireless carriers, which severely extend the time updates reach users.